Next time you hold a gathering, you may want to hoodwink your guests by serving them these lovely “soft-boiled eggs” for dessert. Try serving them along with some coffee or liqueur as well. Bet your guests will think you have gone off your rails for sure! 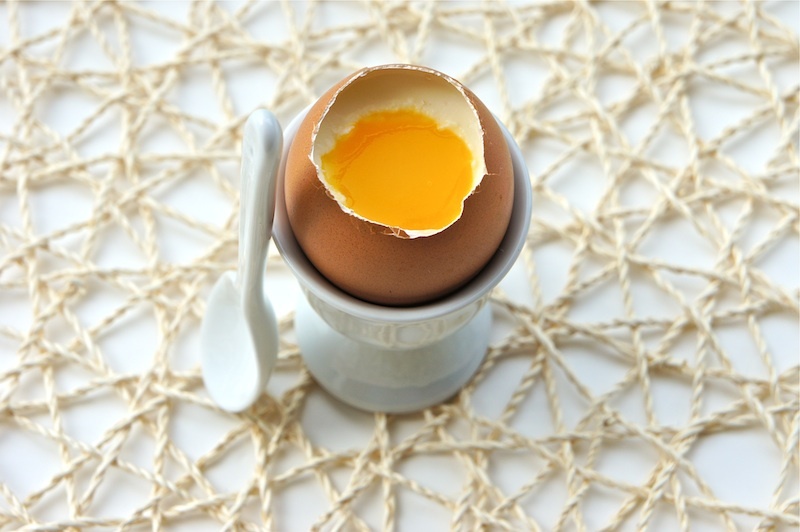 These Coconut Panna Cotta With Mango And Orange Eggs are so much fun and I am sure it will put a smile on the face of anyone you serve it to! Don’t you think they look a lot like soft-boiled eggs? I think it’s also a good trick to pull off on your kids this Halloween. I found this fantastic recipe from the British Larder website. I just made a minor tweak by substituting the recipe’s passion fruit with a mango and orange juice puree instead. Do check out the British Larder website for the original recipe and hope you will have as much fun as I did making these fun and lovely dessert. 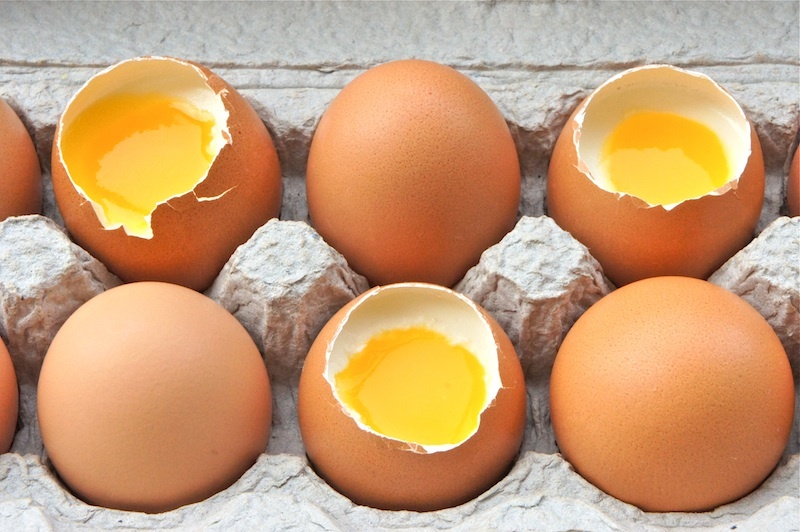 18 Cleaned Egg Shells – please refer to the British Larder for cleaning the eggs. Combine 4 Tbsp of cold water and gelatin in a small bowl. Let it stand for 5 minutes to soften. In a saucepan, combine the coconut milk and cream. Bring it to a boil and simmer for one minute. Remove the pan from the heat and add the white chocolate and gelatin. Stir the chocolate and gelatin until completely dissolved. Strain the mixture through a fine sieve and pour it into the prepared egg shells. Refrigerate until firmly set, about 4 hours. Once the coconut panna cotta has set, use a small scoop to scoop out a small bit from the center to make a small indent. This is for the mango and orange fruit jelly which resembles egg yolk. Only prepare the mango and fruit jelly when the coconut panna cotta is completely set and you have scooped out the holes in the center of the panna cotta. Put the mango, orange juice, and sugar in a blender. Puree the mixture until smooth. Taste, then add more sugar if necessary. Combine 2 Tbsp of cold water and gelatin in a small bowl. Let it stand for 5 minutes to soften. Pour the mango and orange puree into a saucepan, heat over low heat until it starts to bubble, remove the pan from the heat and mix in the gelatin. Stir until the gelatin has completely dissolved. Pass the mango and orange puree through a fine sieve and leave it to cool completely but not set, it must be pourable. Then slowly pour the mango and orange jelly into the center of the coconut panna cotta. Return the eggs to the refrigerator and let the jelly set, about 2 hours. I'd definately try this out one day. Great job Angie! Thanks for sharing the recipe. This is an amazing recipe. Saved it so I can try it sometime soon. Your site is really cute, and I love the name! What a terrific presentation! I love mango. I've added your recipe to my collection of mango recipes and have already purchased the ingredients to make it this weekend. Congrats on the top nine!